Sailor Moon blasts Death Phantom with her Moon Rod. There’s a bright light and suddenly everyone finds themselves back in front of the Crystal Palace. 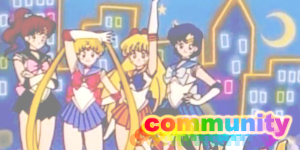 They soon realise that Sailor Moon is missing however and Tuxedo Mask immediately disappears too. 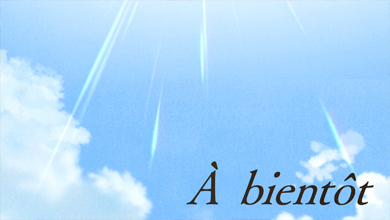 Within the Crystal Palace, Neo Queen Serenity awakens and goes to where her Sailor Guardians and husband are lying. She kisses King Endymion, awakening him, and the two exit the palace to greet everyone outside. Sailor Chibi Moon is happy to see her parents alive and apologises for causing the catastrophe. Neo Queen Serenity tells her not to worry and explains that she was possibly awoken by Chibi Usa’s own awakening and that Sailor Moon was transported to the Planet Nemesis in deep space. 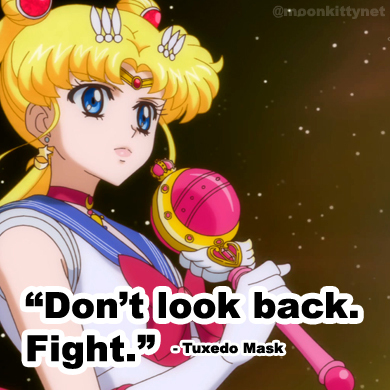 Tuxedo Mask was apparently taken there as well after being unconsciously drawn to Sailor Moon. 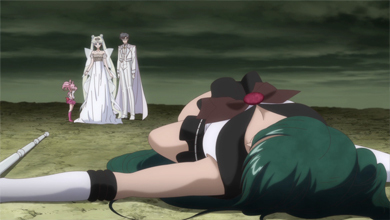 Seeing Sailor Pluto’s body lying nearby, Neo Queen Serenity thanks her for her hard work and promises that she will sleep for eternity within the Crystal Palace. 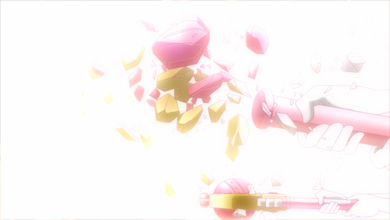 She then uses her powers to move Sailor Pluto’s body there. 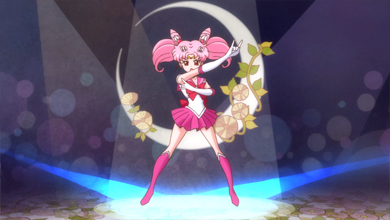 She then summons her Moon Rod and hands it to Sailor Chibi Moon. She tells her that with her own power and the Space Time Key from Sailor Pluto, she will be able to teleport to where Sailor Moon and Tuxedo Mask are. She does so. Deep in space just above Nemesis, Sailor Moon and Tuxedo Mask confront Death Phantom. He tells them that because of the power of the Legendary Silver Crystal, Sailor Moon will always attract forces who wish to wield it. Sailor Moon begins to wonder if the crystal is a bad thing but Tuxedo Mask reminds her of all the lives it’s saved. He then tells her that his main mission is to support her strength but she counters by telling him that she can only activate the crystal’s power with him by her side and that together they have infinite power. 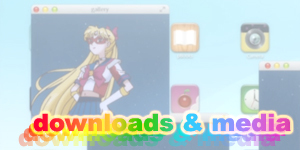 The two kiss and Sailor Chibi Moon appears. 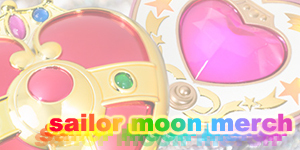 Sailor Chibi Moon and Sailor Moon both attack with Moon Princess Halation and destroy Planet Nemesis and Death Phantom. 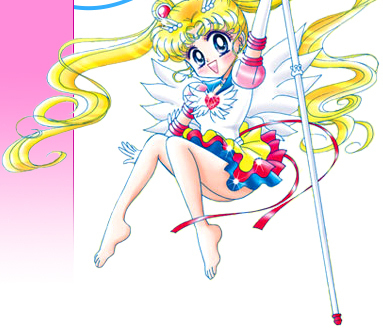 Sailor Moon's Cutie Moon Rod is destroyed in the process. 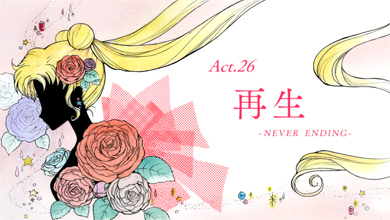 Back on Earth, Neo Queen Serenity revives Crystal Tokyo and its citizens and tells everyone that Sailor Moon and Sailor Chibi Moon have succeeded. 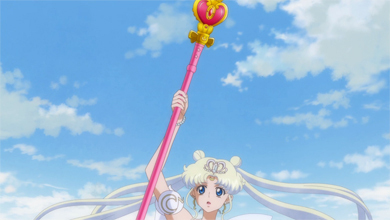 A brand new rod called the Spiral Heart Moon Rod appears in her hands and she uses it to grant Sailor Mars, Sailor Mercury, Sailor Venus, and Sailor Jupiter a new level of power called, Planet Power. 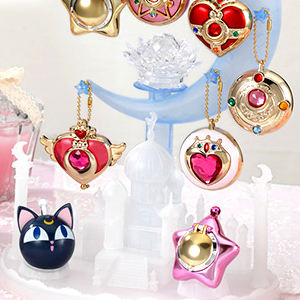 Neo Queen Serenity then reaches out and grants Sailor Moon a new brooch from afar; the Cosmic Heart Compact. 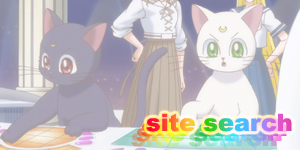 Neo Queen Serenity and King Endymion return to the Crystal Palace as Sailor Moon, Tuxedo Mask, and Sailor Chibi Moon return. 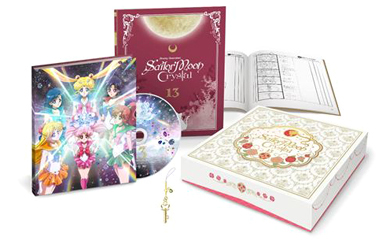 Sailor Chibi Moon takes them all to the Space Time Door to return them to the past. Sailor Moon and Neo Queen Serenity consider meeting each other but are reminded of the dangers of the same person from different time periods being in the same space and time. Despite the risks, Neo Queen Serenity, King Endymion, Diana, and the future versions of the Sailor Guardians, Artemis, and Luna all run to the Space Time Door to say goodbye. 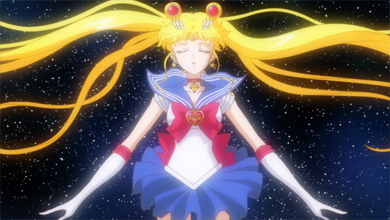 They all wave their farewells and Neo Queen Serenity thanks Sailor Moon for everything she’s gone through. 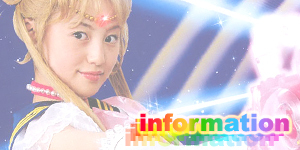 The next day, Usagi wakes up in her bedroom back in the present. Chibi Usa comes in and says good morning and soon the two of them depart on their way to school. 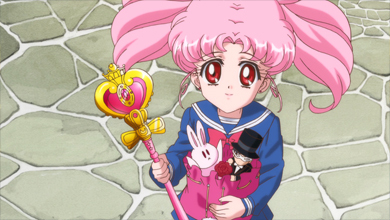 Chibi Usa tells Usagi that she has to return home to the future today but Usagi reacts badly and runs away. Eventually she meets up with Chibi Usa in Arisugawa Park and says her farewells. Chibi Usa gives her Neo Queen Serenity’s new Spiral Heart Moon Rod and leaves. A short time later, Usagi meets up with Mamoru in the same park and thinks about how he will always be by her side. As they begin to kiss, Luna P and Chibi Usa return from the future and land right on Usagi’s head as they did when they first arrived. 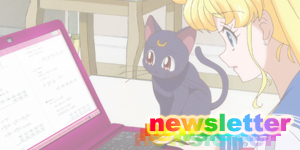 Chibi Usa hands them both a letter from her mother which casually asks for Usagi to look after Chibi Usa once again. Usagi screams Chibi Usa’s name but this time she’s happy. 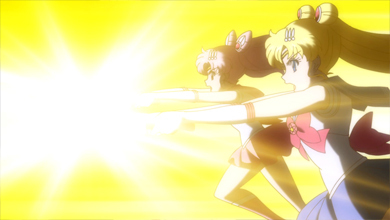 This was the first and last time Sailor Chibi Moon used Moon Princess Halation. 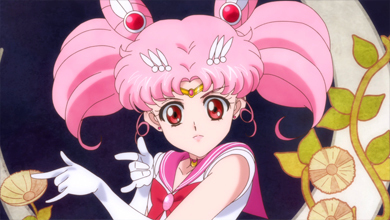 The Spiral Heart Moon Rod appeared for the first time in this episode. As with a lot of locations in Sailor Moon, several featured in this episode are based on real areas in Tokyo. 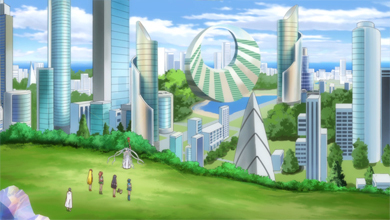 One being the intersection Usagi and Chibi Usa walk through after leaving their house (this can be easily seen when walking from Roppongi to Azabu Juban) and the other is Arisugawa Park, which has been featured heavily in Sailor Moon Crystal. 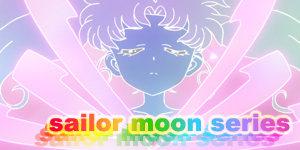 Sailor Moon’s conversation with Tuxedo Mask about infinite power together could be a deliberate precursor or tease for the next story arc that begins in the following episode. The third season of Sailor Moon Crystal features heavy use of the word infinity (mugen in Japanese) such as the name of the school where Sailor Uranus and Neptune attend, Infinity Academy (bizarrely called Mugen Academy in the English subtitles).